Cambodia is currently being stripped of its natural resources – including timber, rubber, and sand – for private gain. Environmental degradation – especially deforestation – is accelerating and corruption is running rampant, with cash from opaque sources flowing into Cambodia’s casinos, banks, and real-estate market. In February, the intergovernmental Financial Action Task Force put Cambodia on its “grey” watch list, noting that no money-laundering case has ever been prosecuted in the country. Cambodia ranked 161st out of 180 countries in Transparency International’s 2018 Corruption Perceptions Index. While Cambodia’s resources have enriched some, the country’s workers are afforded little protection, and those fighting for change risk a violent end. In 1997, a grenade attack on a peaceful protest in Phnom Penh, which I was leading, left 16 demonstrators dead. More than 100 others, including the trade-union activist and opposition leader Chea Vichea, were injured. In January 2004, Vichea was shot dead in broad daylight. Today, as the international garment associations noted in their letter to Hun Sen, leaders of existing unions continue to face criminal charges and convictions for doing their job. And the Trade Union Law adopted in 2016 restricts the creation of new unions. 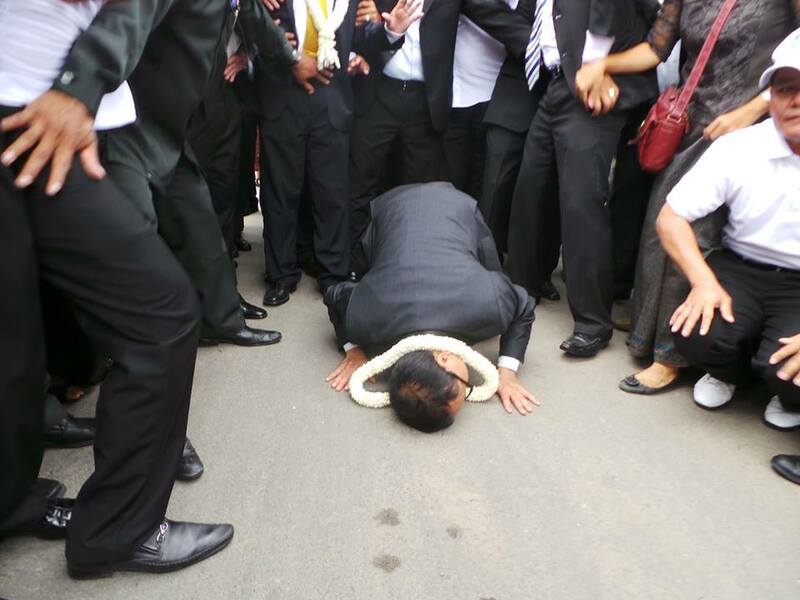 Hun Sen’s political opponents face similar repression. Kem Sokha, the leader of the Cambodia National Rescue Party (CNRP), of which I am a co-founder, was arrested in September 2017 and spent a year in prison before being transferred to house arrest. He has been detained without trial for longer than the 18-month maximum dictated by Cambodian law. And the CNRP, which won close to half the votes cast in both the 2013 general election and local elections in 2017, was dissolved by court order ahead of the general election in 2018. With only fake opposition parties allowed to participate in that election, the ruling Cambodian People’s Party (CPP) won every seat in the national assembly. With that, the Cambodian people have effectively been stripped of their right to self-determination. In this context, it is impossible for any ethically responsible investor to justify doing business in Cambodia. That is why the buyers’ associations have called upon Sen to establish a binding timetable for concrete improvements. But the chances that he will heed that call appear slim. Insofar as the Khmer Rouge ever had an intellectual justification for the horrors they committed in Cambodia between 1975 and 1979, it lay in their belief that Cambodia had no need to participate in international markets and could, through sheer brute force, achieve autarky. Hun Sen, a former Khmer Rouge commander, appears to be clinging to a variant of this assumption. This will prove to be a grave mistake. Chinese capital will never be sufficient to offset lost Western investment. And, because Cambodia’s export goods compete with China’s domestic production, China imports little from Cambodia. It does not have to be this way. Cambodia boasts unrivaled tourist attractions, large stores of natural resources that could be profitably and responsibly exploited, and one of the world’s youngest labor forces. In the 1960s, it was one of Asia’s fastest-growing economies. By now, it could – and should – have become a middle-income emerging economy on par with neighboring Thailand and Vietnam. Four decades after the Khmer Rouge were ousted from power, their reign of terror can no longer be used as an excuse for this failure. After all, Cambodia is not the only emerging economy with a troubled past. Other countries have recognized and adjusted to shifting Western investment priorities, raising their game in terms of environmental sustainability and human rights. They are now attracting growth-enhancing foreign capital. Cambodia needs to do the same, with or without Hun Sen. Otherwise, it risks being left behind permanently. Sam Rainsy, Cambodia’s finance minister from 1993 to 1994, is the co-founder and acting president of the opposition Cambodia National Rescue Party (CNRP). He lives in exile.